Imagine being able to sell your development quickly and efficiently off plan. The cash flow benefits are enormous. Well with a property brochure you can! Our property brochures are designed to reflect the quality of your development and to complement your individual company brand through innovative design concepts. Every project is different and our graphic designers are constantly scanning the horizon for cutting-edge ideas to provide you with the best in effective creative design. 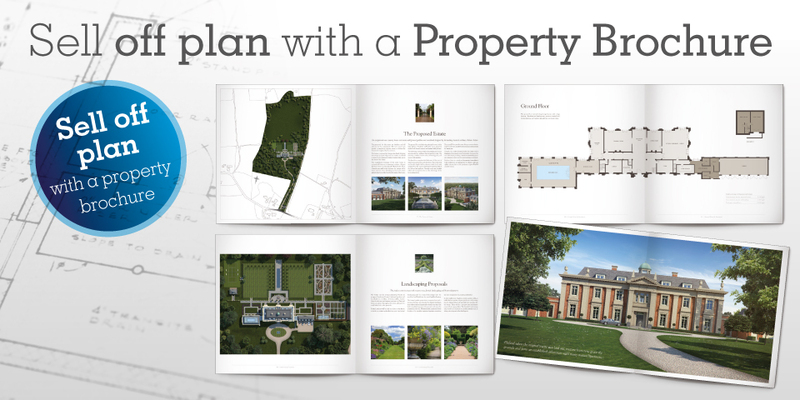 Every one of our property brochure designs is unique and bespoke. Our designs have a proven track record in selling and maximizing the return on your development. In the recession, our brochures helped a number of our clients sell their projects before stared work on site. Each element is carefully considered. In the first instance, we research the market that the project is designed to appeal to. We then create a number of initial designs tailored to its particular demographic. The next stage is to write compelling and engaging copy for the brochure. This involves a description of the local area and the development itself. Whilst the copy is being crafted our designers are working on the artist's impressions and the hand-drawn floor-plans. We work from the architect's CAD, stripping out superfluous information, to make them easy to interpret. Maps of the local area showing points of interest and major roads are drawn up and finally, an aerial site-plan is added to the design to complete the property brochure design. The process involves constant communication with the client to ensure a perfect result. Take a look at some of our latest property brochure designs.